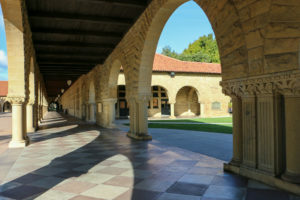 After two public accusations of sexual assault were made against former Stanford English professors last week, an email from the English department chair told faculty to redirect press questions to University staff rather than talk to the media themselves. Roberta Bowman Denning Professor of Humanities Elaine Treharne framed the message as an infringement on professors’ freedom of speech, a characterization that University and English department representatives disputed Sunday. Treharne criticized the message in light of the administration’s vocal support of free speech ahead of self-proclaimed Islamophobe Robert Spencer’s Nov. 14 visit to campus. “I find it hilarious (not hilarious) that on the day the Provost ‘defends free speech,’ a mandate comes down from University Communications that no English Department faculty member is permitted to speak to the press,” wrote Treharne in a Friday post to a public Facebook group. Treharne was referring to remarks on free speech Provost Persis Drell made to the Faculty Senate on Nov. 9. The note to English faculty came at the request of the School of Humanities and Sciences (H&S) communications office rather than central communications, said Lisa Lapin, vice president for University communications. According to University spokesman E.J. Miranda, the request was intended to protect involved parties’ confidentiality rather than limit employees’ expression. Alex Woloch, English department chair and Richard W. Lyman Professor of the Humanities, also wrote that privacy concerns were the main motivator behind the message in an email to The Daily Sunday evening. “My understanding of this is that because the University’s investigations of these cases are bound by strict confidentiality rules, and in order to protect the integrity of possible investigations, they want to make sure that any statements about these cases from representatives of the University are as accurate as possible, and that they do not violate any confidentiality or privacy regulations,” he wrote. But “all faculty should feel free to speak their minds about these important and pressing issues,” Woloch said. Information about the ultimate source of the instruction to faculty initially conflicted. While Treharne and Woloch attributed the message to University Communications, Lapin said that Woloch sent out the message in conjunction with the University’s H&S communications office specifically. Lapin acknowledged issues with the message given to faculty, saying Woloch’s note was “not correct” because it did not discuss the confidentiality laws that keep the University from discussing the cases in question. In the meantime, English faculty members The Daily contacted about the sexual harassment and assault allegations have given mixed responses. While some professors declined to comment altogether, David Palumbo-Liu, Louise Hewlett Nixon Professor and Professor, by courtesy, of English, offered a statement on the issue. Treharne did not comment for this article, and had changed the privacy setting on the group she posted in to private as of Sunday night. Contact Brian Contreras at brianc42 ‘at’ stanford.edu. This post has been updated to reflect additional information about the specific University communications division behind the message to faculty. Brian Contreras '20 is a Managing Editor for the News section. A junior studying STS and Anthropology, he hails from Washington, DC and hopes to pursue a career in tech or policy journalism. He is also interested in satire, backpacking, sci-fi, running, and using Oxford commas (no matter what AP Style says). Contact him at brianc42 'at' stanford.edu.